"This is a great recipe for pizza lovers! Everyone will want second helpings of this dish. It's a great one-dish meal for the whole family." Preheat the oven to 350 degrees F (175 degrees C). Cook the ground beef and onion in a large skillet over medium heat until evenly browned. Drain off grease. Season with salt, pepper, and garlic powder. Spread the sliced potatoes in a layer on the bottom of a 9x13 inch baking dish. Spread the ground beef and onion over the potatoes. Place slices of pepperoni over the ground beef. In a saucepan over medium heat, combine the tomato soup, Cheddar cheese soup, and milk. Season with oregano, Italian seasoning, and brown sugar. Mix well, and cook until heated through. Pour over the contents of the baking dish. Cover the dish with aluminum foil, and bake for 30 minutes in the preheated oven. Remove the aluminum foil, sprinkle mozzarella cheese over the top, and bake for an additional 15 minutes, until the cheese is melted and bubbly. 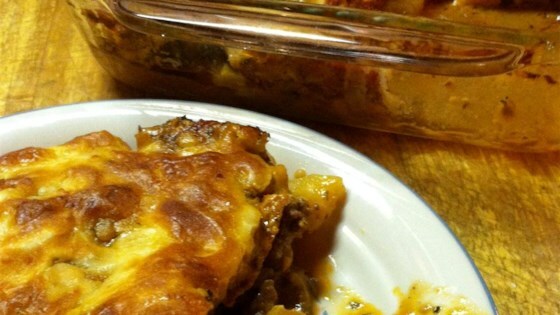 Try this super simple, tasty, meat-and-potato casserole. Great dish! I used tsp of the sugar and oregano, omitted the pepperoni but added chopped green and red bell peppers and used tomato sauce instead of the soup. Very good stuff!